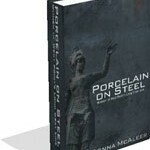 In an era where the American public is saturated with images and accounts of women selling sexuality and self-centered materialism, PORCELAIN ON STEEL: Women of West Point’s Long Gray Line (Fortis Publishing, 2010) by award-winning author Donna McAleer spotlights 14 women, all West Point graduates, who chose to make a positive contribution to society. The United States Military Academy at West Point is America’s oldest and most respected leadership institution. Since 1802, West Point has given the country some of its greatest generals and presidents. For 173 years it was all male. In 1976, it opened to women, allowing women to break the gender barrier and reach the top levels of leadership in the army. There is much to be learned from the women that enter and graduate from the US Military Academy. As a strong and positive influence, the examples West Point women set can help others understand their own limits and then show them how to ignore them to achieve their goals. Rich, poor, immigrant, native born, black, white, Hispanic, straight, and lesbian, representing a cross-section of American Society, each came to West Point with different personal goals but sharing the desire to serve their country. These women come face to face with challenges like losing a limb in battle, fighting life-threatening cancer and dealing with the death of a spouse. Their qualities and strength of character would lead to success in any era, but their stories are especially relevant today. They give inspiration that when one is determined to succeed—it can be done, regardless of barriers. Performing a soldier’s marriage ceremony and then his funeral—how do you comfort someone who went from wife to widow, from bliss to bereavement in only a year? How do you help cadets, soldiers, and military families that struggle to manage competing demands of serving both God and country and with the moral dilemma of faith and fighting? How do you deal with a mother institutionalized for mental illness and growing up in foster homes and juvenile detention centers? What kind of life does that set you up for? Cynthia Lindenmeyer can tell you how she does these things and how she turned an arrest for shoplifting as a child into the determination to change her life. A 1990 graduate of West Point, she ultimately became an Army Chaplain and earned a Master’s Degree of Divinity from Duke University. After a successful career of 16 years of active duty, Lissa Young, a 1986 graduate, Army helicopter pilot and former West Point instructor was outed and forced to resign her commission because of the nation’s “Don’t Ask, Don’t Tell” policy. Instead of fighting back, Lissa chose to embrace her dismissal as an opportunity to explore new ventures. During a parachute jump while in the Army, Nancy Hogan plummeted with both main and reserve parachutes tangled around her neck. Terribly injured by the impact, doctors felt she would never walk again on her own. Then, she was diagnosed with kidney cancer. She overcame both devastating challenges to live and walk again. A 1995 graduate of West Point, Nancy, though still physically challenged, is now a dedicated advocate for veterans having served as a director at Paralyzed Veterans of America (PVA) and now as a legal counsel for the US Senate Committee on Veterans Affairs. The women profiled in Porcelain on Steel forged successful careers in the military and in civilian life, giving back to their country and their communities. These are the stories of mothers, daughters and wives; the stories of educators and athletes; of doctors and lawyers, and officers; who all started as soldiers. Awarded a Gold Medal in 2010 for non-fiction by the Military Writers Society of America (MWSA), Porcelain on Steel is a book for your daughter, your sister, your best friend, and yourself. America’s youth as well as parents in search of stories of inspiration, education, courage, loyalty, public service and leadership that set a positive direction for our young people should read this book. If your Senior Won't Let go: Tips to De-Clutter a Hoarder!